Welcome to The Cat's Meow, Tarot and Talismans,LLC! ~ Supporting and following the official Code of Ethics. ~ Certified Reiki System Practitioner. I am available for private readings, consultations, parties and healing sessions in the Louisville, Kentucky area. For a brief description of these services please see below. To schedule an appointment for a private and personalized session or for more information, please visit my Contact Page. ​For pricing information, please go to the Store Page. Thank you! I am located in the Louisville, Kentucky area and I offer private Tarot card readings and spiritual healing sessions by appointment. These sessions are more in-depth and allow for privacy as well as an environment and experience that is free from distraction and disturbance. For more information on pricing, please visit my Store Page. To schedule an appointment for a private Tarot or healing session, please visit the Contact Page. I am happy to provide readings over the phone or via Skype, WhatsApp, Facebook Messenger, or other messenger apps as well as by email for those who are unable to come in for a personal session. For more information on pricing, please visit my Store Page. In order to schedule a reading by phone or email, please visit the Contact Page. Tarot readings are a great way to make an event more entertaining and unique. I offer my Tarot reading services for small gatherings and corporate or fundraising events such as birthdays and staff appreciation days. For pricing information, please go to the Store Page. 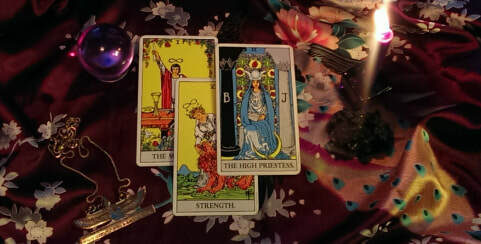 ​ To schedule Tarot Reading Services for an event or for more information, please go to my Contact Page. For pricing information, please go to the Store Page. To schedule an intuitive healing Reiki Session or for more information, please visit my Contact Page. 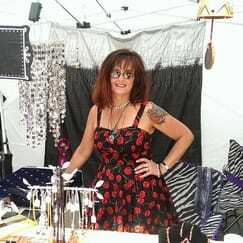 In order to make myself more available, I do make an effort to schedule and attend a variety of community festivals and fairs. These events allow those who might not normally visit a psychic or a medium to have that opportunity. I feel it is important for everyone to have access to the loving and intuitive guidance of Spirit and those who have passed on. For dates and locations of upcoming events visit my Upcoming Events Page or my Facebook Page. Please feel free to visit my other social media sites as well! I design, cleanse, bless and consecrate jewelry and other objects for use as personal Talismans. These items are made with intention for specific purposes such as protection, healing, personal empowerment, and good fortune. To learn more about this process, please visit the About Page. To view Talismans which have already been created and are available for immediate purchase, visit the Store Page or click below. At your request, I will design a personal Talisman for you based on the results of your individualized Tarot reading or an express consultation. To learn more about this process, please visit the About Page. To schedule an intuitive Tarot reading and/or Talisman consultation, please go to my Contact Page. Items that make ideal Talismans are things that you carry or wear frequently, such as key chains, wallets, pocket knives, pens, rings or watches. If you have an item of sentimental value that you already own, I can cleanse and bless it for you, or incorporate it into the design of a new personal Talisman or jewelry piece. Once the item is re-purposed and redesigned, it can be charged with a new intention that is appropriate for you and your current circumstances. Old clip-on earrings, pins and other objects which you no longer wear or use are ideal for this renewing process. I also love to bless items for the protection of your pets, such as collars and tags. To learn more about these processes, please visit the About Page. To request or discuss the blessing or re-purposing of an item, please visit my Contact Page.